The judge and general Jephthah maked a vow to sacrifice the first thing that came out of his house when he returned victorious from battle. When it was his daughter who danced out of his house, he maked no effort to rescind his oath. To further complicate matters, Jephthah made his vow under the influence of the Spirit of Yahweh. His military victory seems to be a tacit acceptance by God of the terms of his vow. Lev. 27:1-8 stipulates a payment can be made to annul a vow made to God. My first question is obvious. Wasn’t there a way to avert this tragedy? After the sacrifice, he retains his position as a judge and is remembered as a great military hero (1 Sam. 12:11). Even in the New Testament he is glorified (Heb. 11:32-34). “Nor do the people, exulting in victory, step in to ransom Jephthah’s daughter, as the people ransomed Jonathan from the oath of his father Saul (1 Samuel 14). No solace comes from God either, no ram in the thicket… She accepts her fate so willingly and obediently that it is shocking…” (Exum, Tragedy, p.58). Incongruently, Leviticus 20:2 and Deuteronomy 18:10 specifically outlaw human sacrifice. How are we to make sense of Jephthah’s slaughter? Why was such a horrific story left in the canon? Literarily we are being set up for the sacrifice. “‘Jephthah’ is an abbreviated form of the Hebrew phrase ‘God opens [the womb],’ which recalls God’s claim on the ‘firstlings’ of the Israelites. “Sanctify upon Me all the first-born,” says God to his Chosen People after liberating them from slavery in Egypt, “Whatsoever openeth the womb among the children of Israel, both of man and of beast, it is Mine” (Exod. 13:2)” (Kirsch, p.213). In reading Jephthah’s name we are to recall that the firstborn belonged to God (Ex. 13:2). “During the formative period of the Federation of Israel, there is the strong implication that human sacrifice was practiced by the people as an acceptable aspect of their Yahwistic belief.” (Green, p.199) As the ancient Israelite religion evolved, the practice was replaced with laws requiring a payment (“redemption”) in place of taking the life of a human being. Many scholars believe that the story of Jephthah predates the laws of redemption. 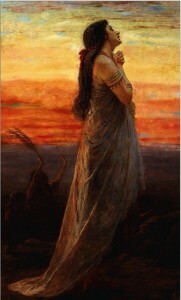 The use of the phrase “and she was his only child” emphasizes the connection between Jephthah’s daughter and the story of Isaac’s near sacrifice where Abraham is told, “Take now your son, your only son.” Jephthah might have thought he was being tested like Abraham and he expected God to stop his sacrifice as well. “…[O]ther biblical makers of vows used similar formulations and were not punished… Abraham relied on God to provide a fitting sacrifice when he said to Isaac: ‘My son, God will provide himself a lamb for sacrifice’ (Gen. 22:8). Why, then, could Jephthah not rely on God to guide events so that a suitable sacrifice would emerge from his house?” (Valler, p.54) Compared to the Abraham and Isaac story, God is conspicuously missing from the Jephthah incident. We could assume that she consents to her death for the purpose of national security; she does not wish to jeopardize future military victories by violating her father’s oath. Or perhaps it is out of an extreme sense of integrity that she refuses to violate the vow. “A protest against her position as a sacrificial offering would be a protest against Yahweh who accepted the terms of Jephthah’s vow” (Tapp, p.170). Some commentators insist that the story is left in the canon because she poses no threat to the patriarchal system. Her ready acceptance absolves her father, God and society of responsibility. We are warned that the more we honor her for her willingness, the more we cooperate in victimizing her. “Praising the victim can, however, be as dangerous as blaming the victim. Some interpreters suggest that the Jephthah account serves to illustrate the steady rejection of God and the withdrawal of the divine in the Book of Judges. “God had been abandoned so many times by Israel and remembered again only when the people are under major threat that, by the time of Jephthah, God has grown impatient with the troubling of Israel (10:6…). Yahweh is merely another party to be bargained with and, once the victory is granted, to be dispensed with, like the daughter.” (Fewell, Judges, p.71-2). The Israelites have rebelled against Yahweh so often that God gives up and refuses to intervene: “therefore I will not continue to deliver you” (Judges 10:11-14). However, it appears that God can’t stop interacting with the Children of Israel. Despite the lawlessness of the people, the Spirit of God rests upon Jephthah. Though we may ignore our scruples and thereby lose the ability to make good choices, the “still small voice” continues to lurk, ready to be listened to. I suggest that God lurks in the actions of the daughter. Although the ancient Israelites considered Jethphah the hero and his daughter a willing victim, we can read the story for the moral and social flaws she exposes to our view. Note that she hardly acts like someone surprised by how events unfold once she greets her father. She already knew what was going to happen. “Jephthah’s vow was most likely made in public at Mizpah in order to rouse zeal for the war effort… Hence, Jephthah’s pained exasperation with his daughter: Did she not know better? Had he not make it plain? Has she done this on purpose to wound him, her father?… She has stepped forth aware of her fate. Her voluntary action passes judgment on her father’s willingness to bargain for glory with the life of another. His priorities (and perhaps those of all Israel) stand condemned” (Fewell/Gunn, p.127). What would be her motivation for purposely walking through the open door to celebrate her father’s return? I propose that she is like a hunger striker willing to die in an attempt to change the social system and thereby prevent future human sacrifice. Her protest begins when Jephthah blames her: “Ah, my daughter, you have brought me very low and have become the source of my trouble.” However, she does not take the blame; rather she places it squarely on her father. “You have opened your mouth to Yhwh; do to me according to what has gone forth from your mouth…” (emphasis mine). She publically proclaims that the responsibility for her death lies with her father. In addition, she retains the power to name the terms and timing of her death. She announces that she will spend two months in the mountains with her companions. Like the daughter, we have the opportunity to stand back and make an assessment of our society where child “sacrifice” is alive and well, where daily daughters continue to be abused. There is a strategy for change in her story, a vision of finding life and justice through communal recollection. “In the absence of God’s intervention, human beings and their social system must prevent such horrors” (Frymer-Kensky, p.116). I believe that the narrator intended us to be horrified by the violence of the story and that we should be equally horrified by our own violent world. Are we going to be like the people exulting in Jephthah’s victory, unwilling to step in and stop the injustice we witness? Like the ancient custom of recalling her story each year, through our acts of justice we memorialize the unnamed daughter. The phrase in the vow wehãyãh laYHWH can only mean consecration, not offering of a sacrifice. It is the conclusion of voluntary celibacy, which was unique in Israel, that forms the basis for the annual celebration of the unmarried maidens. There is some evidence in the Hebrew Bible, and parallels in other ancient cultures, of women consecrating themselves or being consecrated to sanctuary service, and having to live a life of chastity in this service. It is not stated in the text that Jephthah put his daughter to death. If the daughter was going to die, she would lament not only her virginity but also her life, and would want to spend her last days with her father, not away from him. There is no condemnation of Jephthah anywhere in the Hebrew Bible which implies that his vow and subsequent fulfillment must have been consistent with the laws of Israel; hence, it was not human sacrifice. Structural parallels with the Isaac story indicate a non-sacrificial conclusion. In this analysis, Jephthah’s daughter remained a virgin and spent the rest of her life consecrated to God, wandering the hills of Israel. Exum, J. Cheryl – Tragedy and Biblical Narrative: Arrows of the Almighty (Cambridge: Cambridge Univ. Press, 1992). Tapp, Anne Michele – “An Ideology of Expendability: Virgin Daughter Sacrifice in Genesis 19:1-11, Judges 11:30-39 and 19:22-26” Bal, Mieke, ed., Anti-Covenant: Counter-Reading Women’s Lives in the Hebrew Bible (Sheffield, Eng. : Almond, 1989) 157-74.